The United States Department of Agriculture Risk Management Agency (USDA RMA) is the primary agency that operates and manages the Federal Crop Insurance Company (FCIC), providing crop insurance for American farmers and ranchers. USDA RMA develops and/or approves the premium rate, administers expense subsidies, and approves products from private sector insurance companies who sell and service policies that cover $117 billion of annual crop liability on an annual premium base of $11 billion. The heart of RMA’s operations are its Escrow processes. Annual indemnity payments have averaged roughly $13 billion over the last three years, with peak payment periods of more than $500 million per week. The legacy system RMA used to support the timely payment of indemnities to producers from Escrow accounts needed to be modernized for greater flexibility, visibility, and ease of use. USDA RMA selected Appian’s Application Platform deployed in a cloud environment to drive definition and provide better requirements management for all FCIC Escrow transactions. Using Appian, the Agency’s first objective was to re-engineer its legacy Escrow payment system that handles over $500 million in payments over the course of a week and $9 billion in indemnities each year. 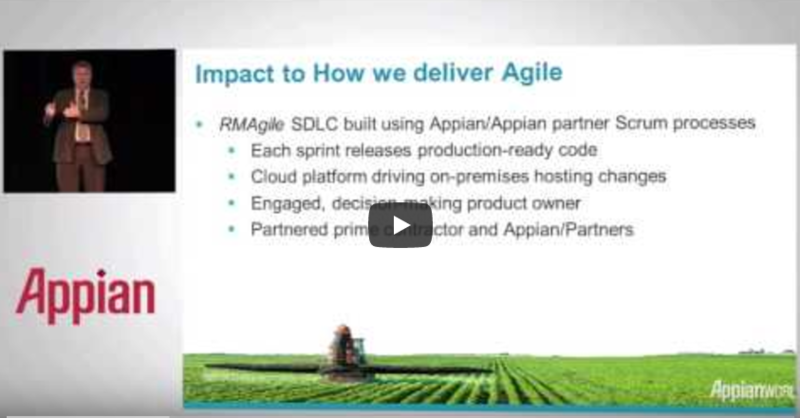 USDA RMA’s new approach is referred to internally as “RMAgile,” as this agile development framework allows sprint cycles to release production-ready code through a cloud platform that is flexible enough to drive on-premise hosting changes. Enhanced program visibility from Appian’s intuitive social interface allows the Agency to process crop insurance requests and issue payments to key stakeholders across the country. Data navigation and transparency from Appian’s flexible cloud hosting allows Escrow transactions and payouts to be awarded in just three days’ time, as opposed to legacy processes which took up to several weeks from start to finish. Through its Appian implementation, USDA RMA rolled out an FCIC Escrow solution that delivered 110 percent of planned functionality for 90 percent of planned cost. The Escrow solution was the first agency application delivered in a Platform-as-a-Service (PaaS) cloud environment, and was the first RMA financial application to be used across the Appian social interface.